I have been into the topic of entrepreneurship lately. I see it as the creative driver of the American economy, but I’ve been struck by the lack of comments from readers on previous blogs on the subject. Maybe entrepreneurs are too busy with their young or potential businesses to be reading Swarfblog, or perhaps the machining community, which is the bulk of our audience, is too beaten down by what they have seen in recent years to want to tackle a startup. I did meet two business starters at Weekend With the Pros, a conference for machinery dealers held last weekend in Detroit. One fellow was on his third business and had used Kickstarter to launch a leather goods startup. The other guy had started his own CNC repair firm. I think we are now in a particularly fertile period to begin a manufacturing business. I’m surprised to have discovered several facilities and groups where potential startup people can learn machining and find access to mentoring and potential investors in the Chicago area such as Workshop 88 and Make-It-Here. I’ve also found an active community in Milwaukee and Madison, Wisconsin. I have to believe there is activity like this all over the country. Companies like Tormach and Pocket NC make good inexpensive CNC machines that startups can afford for prototyping and experimentation. There are also many good affordable machines for additive manufacturing. Esben Østergaard, Universal Robots Founder at IMTS. The equipment is available, and knowledge is being volunteered in many locations. I believe demand is always there for people who can solve a problem in the marketplace. Perhaps the classic current example is Universal Robots, whose founders in Denmark saw the problem and opportunity clearly. Companies desperately needed an inexpensive, easily programmable robotic arm in their factories. After literally living on crackers in a borrowed workplace, the founders built a viable prototype that won them seed money to produce a salable product. Within a few years they sold the company for $285 million to Teradyne, an American tech firm. In Sunday’s New York Times Magazine, a long piece discussed the importance of Facebook in propelling fledgling businesses to stardom. The focus was on Hubble, a three-year-old startup out of New York City, that markets lower cost contact lenses. Facebook’s uncanny ability to target potential Hubble buyers using its vast data network has enabled Hubble’s founders to build a business valued at $210 million. The 20-something guys who started it show us that fortunes still can be made if you solve a problem and get to market quickly. In Chicago, childhood friends Peter Rahal and Jarad Smith are selling their protein bar company RXBAR to Kellogg for $600 million. They started the company in 2013, rolling oatmeal nuts and sweet goo in Rahal’s parents’ basement at night and selling the bars in local gyms during the day. Kellogg is willing to pay $600 million for the still small company because they desperately want to crack the healthy natural protein bar market that caters to young health-conscious buyers. Many entrepreneurs fail or languish, but the ambitious, tenacious, persistent person who can provide a product that solves a problem still can find success. Question: If someone offered you $100,000 to start a business what would you do? A restaurant. Nobody has time or cares to put the effort into making their own meals. I would start with one and duplicate it into a number of locations, keeping a “local” flavor to the locations. One thing I notice about these big success stories in the news is that they are usually for an item a consumer would purchase. For consumer/retail items I suppose Facebook/Social Media would be useful. Although I have very little experience with Facebook, would Facebook be useful for buying/selling business-to-business items? I’m talking about, say, raw aluminum stock or custom machined parts. I know that I can upload a drawing to Alibaba (in China) and get multiple, competitive quotes for custom machining within 12 hours. Is there a place in the U.S. that I can do that? To answer your question – I’m not really interested in starting another business. I’m content running the one that I already have. One thing for sure I would not open it in California. Yes, but no employees, just robots and automated equipment. Finally a worthwhile idea on creating jobs! Imagine the results of investing the huge sum Wisconsin is giving to Foxconn in our young people instead. My new forever home is in Oil City PA, once the home of Standard Oil, Pennzoil, Quaker Stae, & Wolf’s Head Oil. The last refinery closed 16 years ago and the locals spend way too much time lamenting it loss. Our Artist Relocation initiative brought 42 artist to the area and created enough demand to fill the old Oil Exchange Building -where 80% of the WORLD’s oil was once traded. Next step -and I am not kidding- is remodeling the old bank to have a brew pub in the ground floor and start up space for programmers above. I remind people that those Fortune 500 companies started out with one or two guys, a shovel, and a dream. Sure, occasionally a wealthy backer provided the shovel in exchange for future profits but the giants grew from small seeds. We need to nurture those seedlings and sometimes provide both seeds and a shovel. And maybe the “founders” will be displaced 55 year olds looking for one last adventure instead of a golf course. The Oil Valley’s empty building could be filled with activity once again if we do this right. Thanks for the mention Lloyd, we at Make-It-Here are all about helping people get their ideas off the ground and into reality. From the escape room owner designing puzzles for his clients, to the concrete pot designer 3D printing the master for making her next mold design, to the custom machine designer/builder fabricating the components for a new gang sawing machine. There are makerspaces all over the country, and their main purpose is to help people learn how to make things. I’m going to comment more on the potential for entrepreneurs today. With the aging of the baby boomers and the struggle to find excellent industrial maintenance employees, coupled with the maker movement, I believe there is potential for a successful start-up. I think the model might look different– maybe less space, for one thing. The money could be used for planning the right niche, some equipment, and marketing. By the way, if you’re in the chicago area, come see and use the Maker Lab at south Suburban College’s oak forest center 16333 kilbourn. I think you’re correct that’s it a fertile time to start a manufacturing company. I suspect the growth will be in disruptive technologies leaving those who are unable or unwilling to innovate are going to be in a bit of trouble. For some reason this reminds me of the scene from the Graduate, where the Dustin Hoffman’s character is taken aside and is told: “I have one word for you…. “plastics”” I think the word to substitute for “plastic” today is “graphene”. 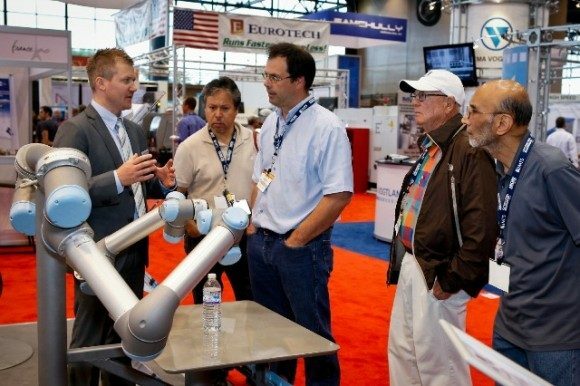 I saw Universal Robots at the IMTS. It is very nice product. Workshop88 the makerspace I’m a member of, has been having a collective hankering to tinker with a robot. U/R’s are a bit out of our price range. Sooner or later we’ll probably either 3d print/machine one, or hopefully someone will donate a small lab robot to the space that’s a basket case the we will resurrect and enhance. While participating at the Chicago North Side Mini Maker a couple years back, I ran into Andrew Wingate with his scara robot. Andrew is the owner of a small startup called Evezor based in the western suburbs of Chicago. We got to talking and he shared with me the kickstarter video he was working on. I was really impressed by the quality of his videos and the passion he had working on his dream. I’m surprised that his kick-starter didn’t get funded, but I hope he keeps at it. It would be cool to see the next Universal Robots be started by a local. As far as you question what business would I start, if I had a 100K. I think it would probably be a software company catering to manufacturing or kick-start some linear motion products targeted for the maker market that I’ve been tinkering with for a while(I’m at rev K). It seems that life/family/work/mortgage commitments along with never having run my own business as well as having a steady paycheck, keep me from taking that plunge.